Not able to foster but happy to help ……? Like all charities, we depend on fundraising to provide us with a steady flow of income. Fundraising allows you to help in whatever way suits you – if you are happy just to turn up for a few hours to hold a bucket for a store collection or help with a tombola at an event, that’s always helpful. Some of our fundraisers will take responsibility for a stall at an event – the fundraising organiser books it, provides goods for sale or tombola, provides a float and leaves it up to them! There are many cat lovers about and some of them have had their cats from the branch – people generally love to talk, show photos of their cats and contribute generously to our collection buckets – if it’s a cold day, we wrap up warmly (we do supply regular volunteers with sweatshirts, fleeces, etc., which gives the branch a professional image) and often do extra well because people feel sorry for us! 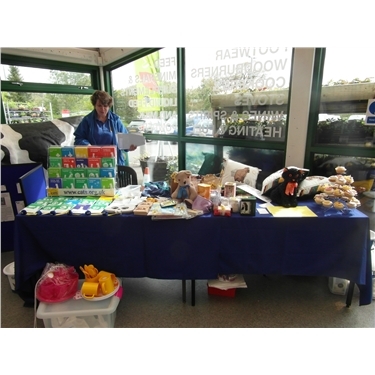 We aim at low cost fundraising as we get some excellent donations from our supporters – that means we concentrate on table top sales, stalls in the Pannier Market and our ‘prize every time’ tombola as well as regular store collections, mainly at Tesco. The fundraising organiser books stalls at events, ensures that there are volunteers available to help, checks that there are adequate supplies of fundraising equipment which can be ordered from Cats Protection headquarters and ensures that we advertise the event on facebook and our website. It is important that accurate records are kept and that funds are either banked or passed to the Treasurer and that collection boxes are emptied regularly. We are looking for someone to think about taking on this role, perhaps starting by working alongside our current fundraising organiser or taking responsibility for some particular responsibilities. Live in the Banstaple area. Have space in your garden for a cat pen. Ideally be able to drive or have somebody prepared to drive you. Be computer literate to update cat details onto an online programme.